The remaining tadpoles have gone carnivorous and don't fancy cucumbers any more, so I've started giving the sinking cichlid wafers I fed them last year. Initially only a few were interested, but it didn't take more to discover this new treat... Looks as though I'll be ordering more of these! 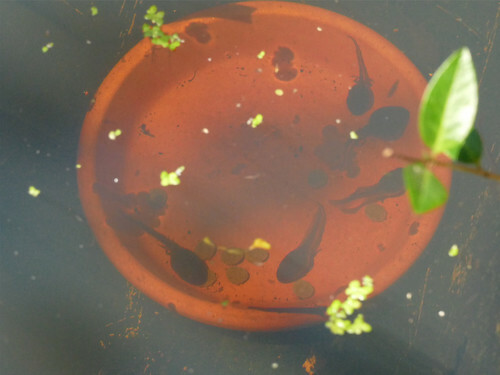 I have been using the wafers this year (having heard about them from you last year) The Great Diving Beetle lavae loved them, probably a good thing as it meant they were eating less tadpoles. 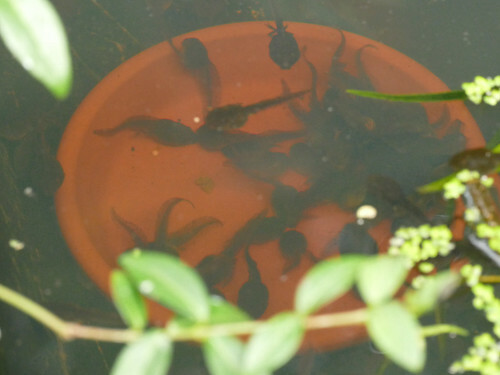 Did not see any tads eating them, nor the newts, but that is not to say they were not as I tried to toss the wafers under the floating greenery. Tthe lavae dragged the wafers out into the open.